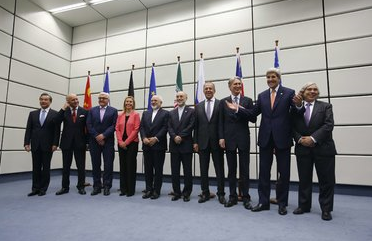 World strikes final “historic” nuclear deal with Iran. Will it bring peace, or war? Here are my initial thoughts. Delegates from Iran and a group of six nations led by the United States in Vienna on Tuesday after reaching an accord. (Central Israel) — Lynn and I flew back home to Israel today, and arrived just as the news was breaking that the international community has struck a final nuclear deal with Iran. Will it bring peace, or war? I am still reading through the 100-page agreement and will have more analysis later. But here are a few initial comments and observations. President Obama and his team are convinced they have cut off Iran’s path to The Bomb and that the world will now enter a season of peace and stability. “Today after two years of negotiation the United States together with the international community has achieved something that decades of animosity has not: a comprehensive long-term deal with Iran that will prevent it from obtaining a nuclear weapon,” the president said. The Iranian leadership is euphoric — they are calling the agreement “historic,” and celebrating their victory over the West. No wonder. They got nearly everything they wanted and gave up no serious concessions. Under this deal, Iran can continue enriching uranium. They don’t have to dismantle any nuclear facilities — not a single one. They don’t have to shut down their ballistic missile factories or dismantle any of their ballistic missiles. They don’t have to promise to stop funding and supporting international terrorism. They don’t have to release a single American citizen held in Iran — not Pastor Saeed or the Washington Post reporter on trial for his life or any of the others. The list goes on and on. Does Netanyahu’s remarks signal military action against Iran is coming, and/or coming soon? That’s not clear. But it cannot be ruled out. Israeli leaders certainly want to find a way to neutralize the Iran nuclear threat without using force. But Israel has successfully used preemptive air strikes to destroy two foreign nuclear facilities over the years, in Iraq in 1981, and in Syria in 2007. The possibility of an Israeli preemptive strike against Iran has just gone up significantly. Readers of this blog know that I wrote a trilogy of political thrillers several years ago — The Twelfth Imam, The Tehran Initiative, and Damascus Countdown — imagining what might happen if a foolish American President inadvertently allowed Iran to secretly build a small arsenal of nuclear weapons, and an Israeli Prime Minister decided he had no other option than to launch a massive preemptive strike against Iran. Still, that was fiction. I pray that nothing in those novels will come to pass. I certainly don’t wish for a war with Iran, especially now that my family and I live in Israel. Indeed, I’m praying for a peaceful resolution to this mounting crisis, and I’m asking the Lord to move mightily to bring down this evil regime in Tehran and end the nuclear threat through any means other than war. But the Lord may allow a war to come. Leaders in this region — both Israeli and Arab — may conclude a preemptive war soon would be far preferable to a nuclear war with Iran later. So we must be ready for whatever comes next. I hope you will join me in praying for “the peace of Jerusalem,” as the Psalmist commands us in Psalm 122:6. Pray, too, for wisdom for the leaders in this region to know how best to deal with this challenge. And pray that the people and leaders of the region turn to the Lord for His wisdom and His grace and salvation, not their own. Again, I will post more analysis in the days ahead as I work my way through the agreement, and as we see how other leaders and nations react to the deal. For now, let me share with you what the former head of Israeli military intelligence noted in assessing the situation: “There are three likely scenarios for where the world goes from here,” notes Amos Yadlin. Iran somehow transforms itself into a less malign state and constructively engages with the family of nations. Unfortunately, this is highly unlikely. Iran decides in a few years to renege on its commitments, as North Korea did in 2003. If Tehran calculates that the gains of this approach outweigh the retaliation it would provoke by the West, there is no doubt they will go for the bomb. Israel and the international community must maintain a credible military option at all times to stop Iran producing a nuclear weapon. Iran plays it safe, keeping to the letter if not the spirit of the agreement, while waiting for any restrictions on it to expire in a decade. While doing this, Iran improves its technological know-how, continues to sponsor terrorism, and calls for the destruction of Israel. Here is the full text of the deal. Here is the video of President Obama’s statement. Here is the full text of Prime Minister Netanyahu’s response.